Panama is one of Central America’s best kept secrets. 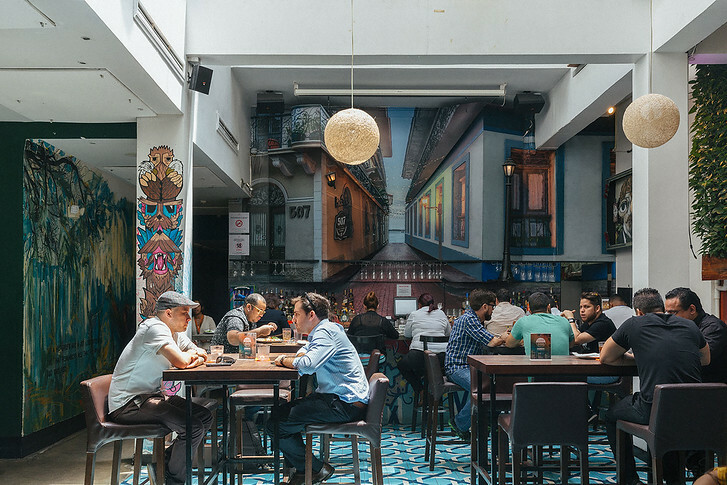 With national airline Copa offering free layovers in Panama City, there’s every reason to visit Panama. Most people associate the isthmus of Panama with the Panama Canal and this engineering marvel is so worth a visit. 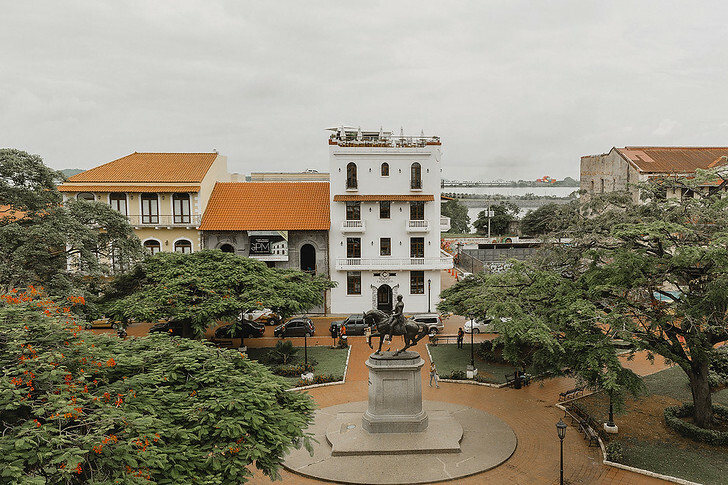 There’s charm in the old city Casco Viejo, modern skyscrapers in Panama City and the largest rain forest in the Americas after the Amazon. We had just a taste of what Panama is all about on a 3 day trip. Here’s a quick travel guide with tips for visiting Panama! Location: Panama is located in Central America and actually belongs to the continent of North America, not South America. Language: Spanish is the primary language spoken in Panama. It definitely helps to have at least a basic idea of common Spanish phrases! Currency: The currency of Panama is the Panamanian Balboa… but the country actually has 2 universal currencies. The Balboa is pegged 1:1 to the US Dollar and we saw usd being used everywhere. Credit cards are widely accepted in restaurants, hotels and grocery stores but it helps to bring some cash if you want to head into the more remote regional areas. Electrical Outlet: Panama uses 110 volt electricity, the same as the US. We didn’t need a plug adapter but had brought our universal adapter just in case. 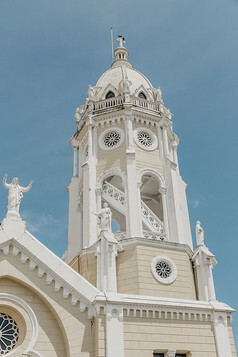 Panama has one of the most unique geographies of any country in the world. Formed by shifting tectonic plates millions of years ago, land deposits pushed together to form a bridge between North America and South America. Panama is often called ‘the isthmus of Panama’ because it features a narrow strip of land bridging two larger pieces. This geography inspired the creation of the Panama Canal and is responsible for Panama’s incredible biodiversity. The Panamanian rainforest has some of the most concentrated flora and fauna to be found anywhere in North America. Panama is bordered by Costa Rica to the west and Colombia to the east. After the country’s independence from Spain in 1821, Panama became part of greater Colombia until it reached independence in 1903. Panama has a tropical climate, with a wet and dry season. Dry season is from mid December to mid April and holidays are especially popular. Low season occurs from mid April to mid December and has sporadic rain showers but also lower prices. We visited in late September and found the weather in Panama to be hot and humid. Bring summer clothes but also pack a long sleeves or jacket as the AC is ramped up in most indoor places. The best way to fly into Panama from New York is through Copa Airlines, the national Panamanian carrier which offers direct routes. Copa offers a free layover in Panama City for travelers heading on to South America so we noticed lots of Spanish speaking passengers on board with us. Panama City’s International Airport is called Tocumen International. We chose to stay in Casco Viejo, the Old Town just outside Panama City. If you like picturesque buildings, trendy restaurants and nightlife, this is the place to be! Panama City itself is a modern city with thousands of skyscrapers. Most businessmen and visitors stay there but come to Casco Viejo at night to have fun. 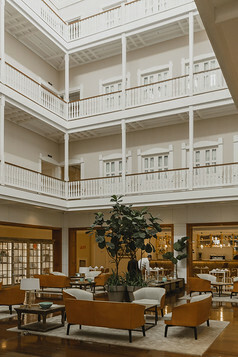 This landmark building has been transformed into one of the best hotels in Panama. 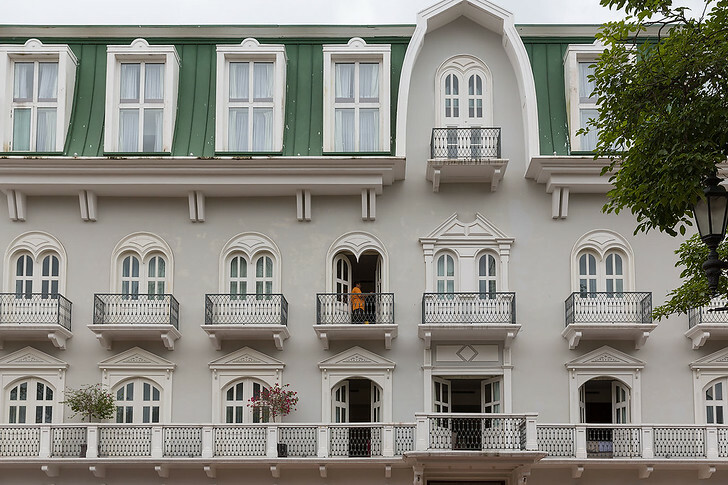 Located right on Plaza Herrera, the hotel is beautifully decorated, with spacious rooms, a rooftop pool and incredible on site restaurant. Highly recommend this hotel! Curious what there is to see in Panama? In short, there’s a little bit of everything! Modern skyscrapers, rainforests, diving paradises and more. 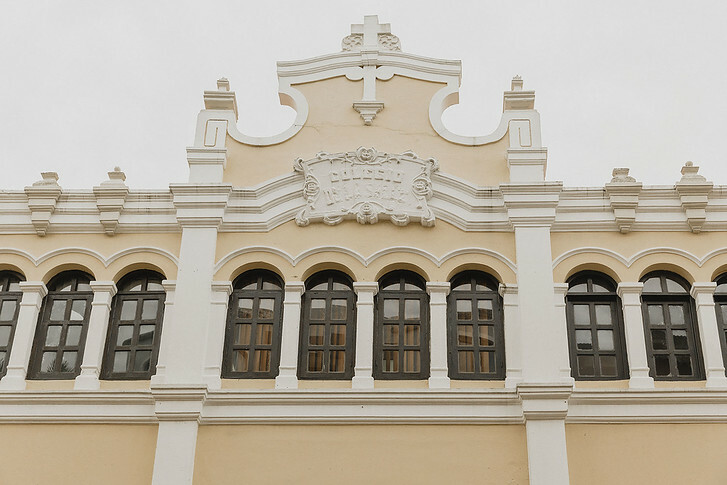 Casco Viejo: Visit the Presidential Palace, see gorgeous Colonial Architecture and witness the revitalization of Old Panama. Panama Canal: Did you know it takes a ship 8 to 10 hours to cross the canal? 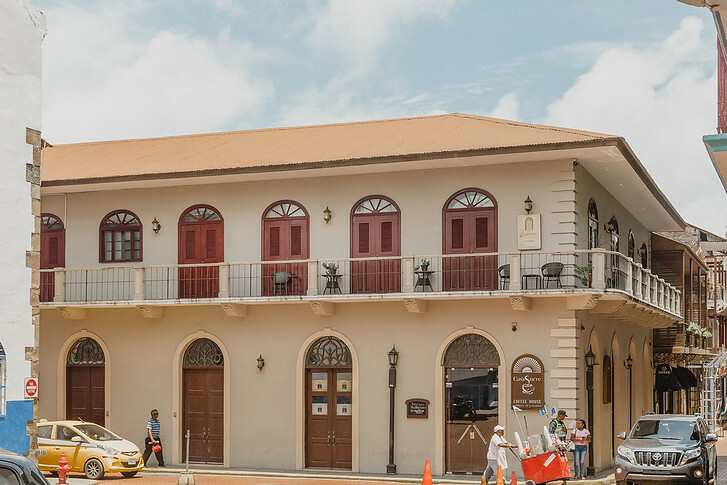 Stop by the Miraflores locks and museum to learn more about the Panama Canal and see a ship pass through! You can read more about our visit to the Panama Canal and its interesting history here. Panama City: a rapidly developing city with ritzy condos, luxury hotels and great restaurants. With additional time, make sure to head outside Panama City to explore Panama’s biodiverse jungles, idyllic island paradises, and green mountain forests. Boquete: This scenic garden area is located in Panama’s mountainous Chiriquí Highlands and is a famous destination for Americans looking to retire in Panama. Visit Boquete for excellent hiking, premier coffee plantations and incredible food. Amadour Causeway: Grab a bike to cycle through the mile long Amadour Causeway. It’s a breakwater connecting four islands and offers incredibly scenic views. San Blas Islands: Panama has an archipelago of 378 islands in the Caribbean Sea. Only 49 of these are inhabited by the local, self-governing Kuna tribe. Get around by boat, snorkel in the coral reefs and relax on the islands. Expect rustic beach huts and bare bones infrastructure – the indigenous Kuna carefully control tourism and are devoted to preserving their ecological marine landscape. 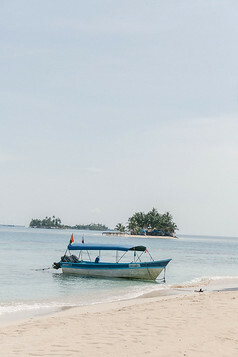 Bocas del Toro: This spot is quite popular for surfing and snorkeling. This Panamanian province has some of Panama’s most popular beaches like Starfish Beach as well as a biodiverse rainforest on the mainland. To visit Panama’s interior, it’s helpful to rent a car or hire a local driver! With a short visit, we spent 3 days in the old town of Panama City, called ‘Casco Viejo’ in Spanish. With colonial Spanish architecture and colorful buildings, this UNESCO Heritage sight makes for a quaint base. You can find our itinerary suggestions this post! With its colonial history, natural biodiversity and Spanish culture, there’s a lot to learn about Panama! We summarized 20 unique facts about Panama in this post. And that’s our mini travel guide to Panama! Flights | Copa Airlines, the national Panamanian airline, offers non-stop flights from select US cities. We hopped on a direct flight out of New York City’s JFK Airport and arrived 5 hours later. Check for flight deals and routes here. 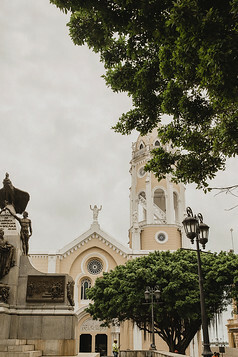 Accommodation | After arriving in Panama City’s Tocumen International Airport, you can opt to stay in Panama City or head to the Old Town of Casco Viejo. 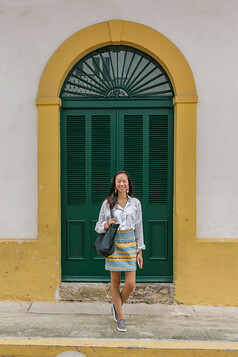 We found Panama City to be quite safe and would highly recommend staying in Casco Viejo for its charm and history. It’s approximately a 20-30 min taxi ride from Panama City Airport. Be prepared for a slower exit out of Tocumen International, as they scan all bags with your person (like in Mexico). Currency | Panama’s currency is pegged to the U.S. dollar and therefore all prices are 1:1. There’s no need to change money and in fact, little need to carry large sums of cash. We were happily surprised to discover that credit cards are widely accepted at restaurants, museums, etc and all our bills were charged directly in USD. Insurance | Be sure not to visit Panama without travel insurance. Whether you get injured and need to be hospitalized, or your phone gets stolen (C managed to lose his for the second time in 2 weeks), travel insurance will help when you need it most. Get a quote for your trip here. 20 Interesting Facts About Panama I Bet You Never Knew These! Seeing the Panama Canal & Why It’s Worth Visiting! It’s certainly on my bucket list, although it may have to wait a while. I think I’d like to combine it with a trip to Colombia via San Blas (I really love Colombia and must go back). Still, Panama looks like an underrated destination with plenty of attractions of its own!